When in Amsterdam you are sure to sample some weeds. 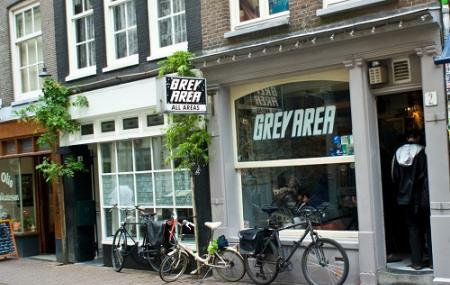 Grey Area Coffeeshop is a heaven for true cannabis lovers, for you will be guided and given nice recommendations by the owners themselves. A cozy little shop, it has a wide variety of good quality medicines to choose from. With interesting décor and lots on the list, be ready for a nice twist and thrill. Create a flawless plan, make use of Amsterdam trip planner. You can add cozy hotels in Amsterdam like Lloyd Hotel And Cultural Embassy, Q-factory Hotel and Amsterdam Tropen Hotel. If you want to add the visit to Grey Area in your trip, you can choose from the variety of Amsterdam vacation packages that can be designed to suit your preferences. These packages also cover your major concern of how to reach Amsterdam. How popular is Grey Area? People normally club together The Hash Marihuana And Hemp Museum and Winkel 43 while planning their visit to Grey Area. People also prefer to end their day with Grey Area. Another of the 20 or so coffee shops we visited while in Amsterdam. This was a small place and seating was very limited. It had a decent selection of consumables, but it was in the bottom half of the shops we visited. Really good and really Nice ! If You Like to be high and surrounded by Nice People. Go here and have fun!